FastAgain PC Booster by Activeris - Boost Your PC. What is FastAgain PC Booster? 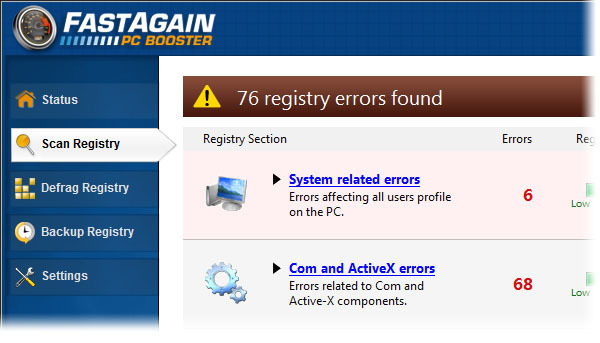 FastAgain PC Booster by Activeris is a registry fixer program. When a user downloads the 'free' trial version it will scan your registry for errors and if some are detected it will require your to active a subscription in order to 'fix' the stated errors. Download Boost and enjoy your PC. Remove FastAgain PC Booster from your PC. Why should I uninstall FastAgain PC Booster? If you do not plan on purchasing the full version of FastAgain PC Booster, you should remove this as it will only report possible errors unless you register the program. To the right of the list item, click the Uninstall button and Boost will completely remove FastAgain PC Booster from your PC. Use Add/Remove Programs control panel in Windows makes to uninstall FastAgain PC Booster. Follow the appropriate instructions below to use this control panel. Select FastAgain PC Booster from the list of programs, and click Uninstall. Alternatively, right-click the program and select Uninstall. Select FastAgain PC Booster from the program list, and click Uninstall. Alternatively, right-click the program and select Uninstall. Select FastAgain PC Booster from the list of programs and click Remove. Boost helps you remove FastAgain PC Booster by Activeris and clean your PC.